Is Gardening Harmful to the Environment? Researchers from the Royal Horticultural Society, the University of Reading, and the University of Sheffield published a paper this month (Cameron et al., 2012) in the journal, Urban Forestry and Urban Greening, called “The Domestic Garden – Its Contribution to Urban Green Infrastructure.” The article attracted attention from the UK newspaper, The Independent, because of the seemingly counter-intuitive claim that gardening can actually be harmful to the Earth, or “eco-unfriendly” according to The Independent. For a mere $39.95 US, you can read the article yourself from Science Direct! Among the indicted are peat, pesticides, petrol lawnmowers, and hardscape materials with high carbon footprints. Even a newly planted tree has a carbon footprint that may not be overcome for as much as a decade. Anyone with knowledge of sustainability already knows these things, but it is good to see it in mainstream publications available to the general public for far less than $39.95. As someone who once had a job writing obituaries for beautiful places (called environmental assessments (EAs) and environmental impacts statements (EISs), I know how that feels! What do you do when you hear bad news all the time? Turn it off. Pessimism leaves little room for action. What’s at stake is more than what makes the best message, it’s what makes the best conservation strategy. Chronicling demise offers little guidance. But if we tell stories about positive outcomes and share details of how they are achieved, the likelihood that they will be replicated will increase. Hope engenders conservation success, and success breeds more success. Fuel creative responses to what is, yes, a bad situation by giving people a reason to think that there is hope. This is a message that is especially important for young people. My children are growing up in a world where they are told that the planet is dying (and that somehow they are charged with saving it). Even if they watch a beautiful sunrise over the Atlantic, there is a little voice in their heads telling them that the oceans are dying. What an oppressive thought! We have to preserve the sense of awe, wonder, and love of the Earth if we are going to motivate people to act on its behalf. IMHO. Over the past 10 years, EPA and the Department of Justice have sought to stop the overflows by suing cities and striking settlement agreements that require massive upgrades. As a result, at least 40 cities or sewer systems across the United States have entered into such agreements with EPA since 1999. The agreements tend to require rebuilding pipelines, expanding treatment plants and digging underground tunnels big enough for subway trains. The tunnels act as storage tanks for stormwater that would normally pour into waterways and allow time for treatment plants to clean up the mess. With eye-opening treatment options like that, it is no wonder that cities are interested in hosting GI experimentation. Hoping to head off even more tunnel construction, the Washington, D.C. Water General Manager is enthusiastic about contributing to the GI body of knowledge! 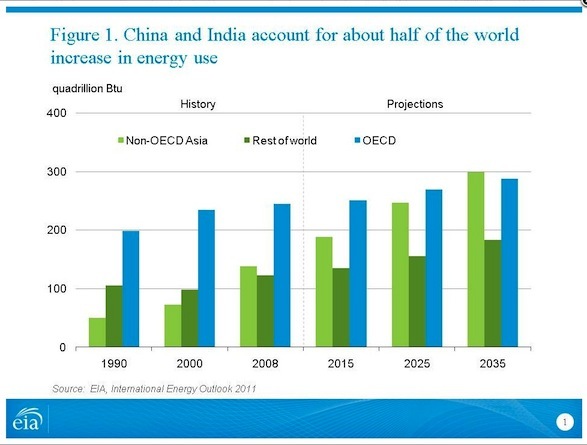 Charts of the Day – From the report, International Energy Outlook 2011 (IEO2011), released yesterday by the U.S. Energy Information Administration (EIA). 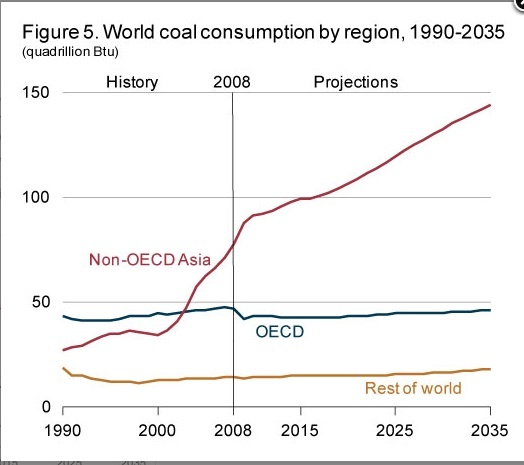 Global energy use is projected to increase by 53% by 2035, with China and India accounting for half of the increase and with coal being the main source. Alternative energy is on the rise, everywhere, but its impact is fairly small in comparison with the projected increase in demand. The decision-making framework we have developed shows that the best timing for moving species depends on many factors such as: the size of the population, the expected losses in the population through relocation, and the expected numbers that the new location could be expected to support. It would also rely on good predictions about the impact of climate shifts on a particular species and the suitability of areas to which they can move – an often difficult issue in the case of rare species because we just don’t have this sort of detailed information. Managed relocation is not a quick fix. It will be used in some specific circumstances for species that we really care about, but it will not be a saviour for all biodiversity in the face of climate change. Yes, controversial or not, people are beginning to actively intervene in species relocation. 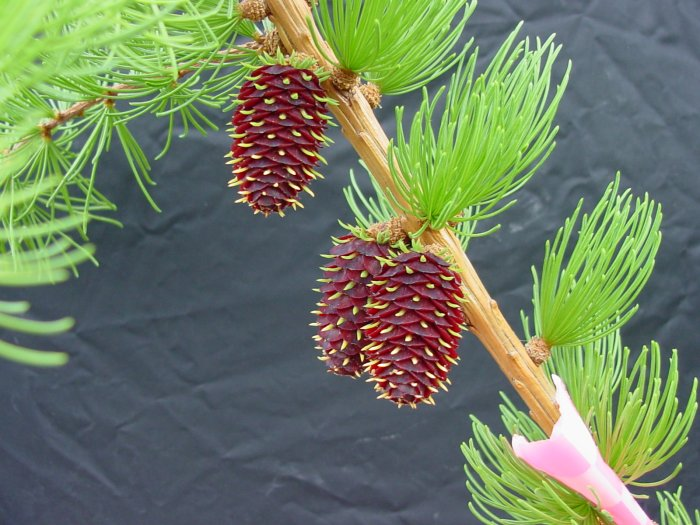 The June issue of Discover magazine has an article titled The Transplanted Forest: A Bold Experiment in Preemptive Climate Adaptation about ongoing efforts in British Columbia to relocate the western larch (Larix occidentalis), an important timber species. A related effort (and a less controversial one) – linked by the idea of active adaptive management – involves altering the habitat itself if possible. A recent New York Times article, titled Seeing Trends, Coalition Works to Help a River Adapt, highlights efforts to aid chinook salmon, another economically important species, in the Nisqually River (Washington State) through stream and watershed enhancements. The coalition is reserving land farther in from wetlands so that when the sea rises, the marsh will have room to move as well; it is promoting hundreds of rain gardens to absorb artificially warmed runoff from paved spaces and keep it away from the river; and it is installing logjams intended to cause the river to hollow out its own bottom and create cooler pools for fish.